Are you searching for a comprehensive yet affordable Downey car insurance quotes? With a 15 year track record of insuring motorists, we offer a range of high quality insurance policies aimed at helping you feel safer and more secure behind the wheel. Our auto insurance policies are designed to give you the personal and financial protection you need to drive with confidence. As one of Downey’s top auto insurance providers, we have a deep understanding of what motorists across the state require from an insurer. Automotive insurance is one of the most commonly sought types of insurance. In fact, California law requires that motorists have at least a minimum level of auto insurance coverage in order to drive in the state. With swift penalties for motorists without insurance and potentially huge costs for any uninsured motorist involved in an accident, it’s essential that you have adequate auto insurance coverage as a motorist. Below, you can find more information about our auto insurance policies, the type of options that are available and the areas we serve. To request a free auto insurance quote, please contact us now on (323) 771-1100 for instant service. Do you need auto insurance in Downey? Under California law, you need auto insurance in order to use public roads without being at risk of fines and/or traffic citations. The State of California requires that all motorists have adequate auto insurance in order to use public roads. Without auto insurance, you’re at risk of being given a traffic citation and/or fined a total amount of $1,000 or more. In some cases, motorists without auto insurance in Downey can have their vehicles impounded with full responsibility for costs. Driving without auto insurance isn’t just a legal risk. If you’re involved in an accident without an adequate automotive insurance policy, there’s a serious risk that you could be held responsible for the full cost of repairs to both vehicles, property damage and the victim’s medical costs. In short, car insurance is essential for safe motoring in Downey. Without insurance you face serious risks not only from a legal and safety perspective, but also to your finances in the unfortunate event of an accident. We understand that purchasing auto insurance can be a confusing, boring process. That’s why we offer a range of auto insurance options to help you get the coverage you need at a fair price that fits within your insurance budget. If you’re involved in an auto accident, there’s a serious risk of other people facing injuries and negative health effects. Bodily injury liability coverage covers the costs of injuries incurred by other people in the event that you’re found to be at fault for the accident. Bodily injury liability coverage also covers the cost of your legal defense, should the other party decide to sue you as a result of the accident. We offer bodily injury liability coverage as an insurance option for your auto insurance policy. In an accident, both you (the driver and policyholder) and other passengers in your vehicle can face serious injuries. Medical or personal injury protection covers the cost of medical treatment for both you and your vehicle’s passengers. Personal injury protection is a type of “no fault” coverage, meaning it its paid out without regard to who is at fault in an accident situation. We offer personal injury protection insurance as part of our auto insurance options. Automotive accidents — particularly accidents that occur at high speed — can result in damage to other people’s property. The most common form of property damage from auto accidents is vehicular, although accidents can also cause damage to homes, stores and other property. Property damage liability coverage is designed to cover the cost of repairing property damage to other people’s property when you are at fault for an accident. We offer property damage liability coverage as an auto insurance option. When you’re involved in an accident, there’s a significant chance that your vehicle could face damage. When this damage is serious, the car may no longer be usable and might need to be replaced with a completely new vehicle. Collision coverage protects you from the cost of repairing or replacing your car after a serious accident. We offer collision insurance as an auto insurance option, with a variety of deductible options for customers. Not all vehicular damage is caused by accidents and collisions. Sometimes, cars are damaged due to falling objects such as tree branches and fences, vandalism and civil disturbances, fire, theft and even wild animals. Comprehensive auto insurance protects you from incurring the costs of repairing or replacing your vehicle if it’s damaged outside of a collision. We offer comprehensive auto insurance for our customers as an automotive insurance option. If you’re involved in a collision with an at-fault driver without insurance, it’s important to know that you’re protected. Uninsured motorist coverage covers your medical treatment bills in the event that you’re injured during an accident with an uninsured driver. Uninsured motorist coverage can also provide assistance in the event that you’re involved in a collision with an underinsured driver. We offer uninsured motorist coverage as an auto insurance option for our customers. We understand that purchasing insurance can be a challenging, stressful process. From start to finish, our goal has always been to provide the highest quality auto insurance services at prices that offer both great service and excellent value for money. As such, our insurance services are known as “comprehensive but affordable,” giving you great coverage at a cost that doesn’t break the bank and make insuring your vehicle an unaffordable, financially difficult process. With nine locations throughout Downey and one in Miami, Florida, we’re a leading insurance provider with a long history of helping American motorists stay protected and insured while on the roads. At Strong Tie Insurance, we’ve been in the business of providing insurance for more than 15 years. Our experienced team has helped hundreds of thousands of people receive the high quality, reliable insurance they need for a safer, more secure life. Over the years, we’ve built strong professional relationships with a wide range of car dealers and rental companies, contractors, body shops and other service providers, letting us provide unmatched service for our customers. As a smaller insurance company, we’re able to provide a level of service that larger brands just can’t match. Available 24 hours a day, seven days a week, our experienced agents are always available to answer your calls and provide the service you need to stay safe and secure. Our goal is always to provide the highest quality, most personalized service to make sure you receive both the protection and individual attention you need as a motorist and vehicle owner. 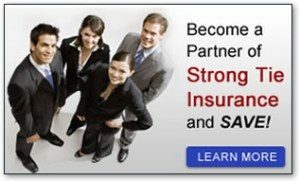 In addition to auto insurance, we offer a complete range of insurance services for individuals and businesses, ranging from home insurance to business insurance and more. Would you like to request a free auto insurance quote or learn more about our services? Call our experienced team now on (323) 771-1100 to request a free insurance quote or learn more about the policies and auto insurance options we can provide for you. Reliable and effective auto insurance is a must-have for any vehicle owner, particularly in the city of Downey that mandate auto insurance for motorists and charge fines and penalties for using public roads without insurance. Our experienced team of insurance specialists has helped hundreds of thousands of motorists in Downey, CA and throughout the United States get the comprehensive coverage they need at a fair, affordable price. From property damage liability coverage to comprehensive auto insurance, we can put together the perfect policy for you based on your needs, driving habits and budget. To get started, call our team now on (323) 771-1100 for a free auto insurance quote and more information about our policies. Our Downey insurance agents are available around the clock to give you the help and expert knowledge you need, when you need it.